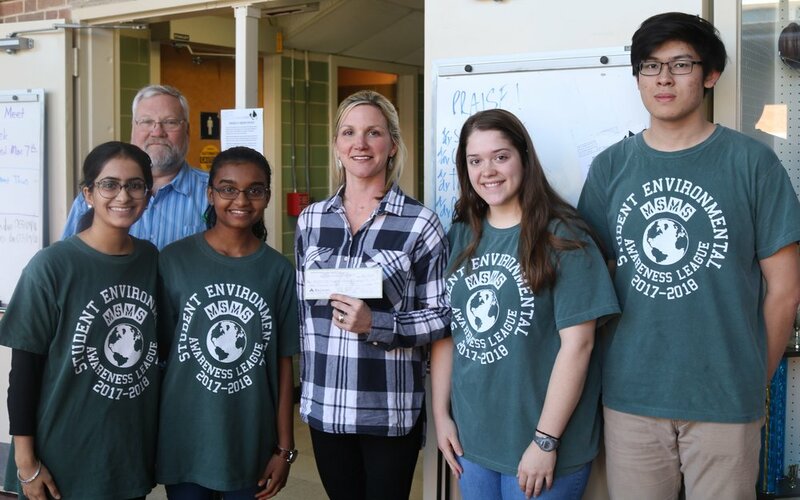 The Student Environmental Awareness League (SEAL), was awarded a $1,000 grant on March 7 to support their electronic waste removal service proposal. The grant program, sponsored by the Mississippi Recycling Coalition, supports the mission of non-profit organizations that work to promote and grow recycling efforts in Mississippi. SEAL plans to expand their current recycling program and develop electronic waste removal services this semester. The club’s current recycling program consists of ten recycling bins placed throughout campus to encourage both students and staff to reduce waste accumulating in local landfills. Materials that can be recycled currently include: paper, corrugated cardboard, #1 and #2 plastic bottles, and boxes of similar substance. Student volunteers and club members then compile the bins and transport them to a larger bin collected by the Columbus City Recycling Center. To apply for the Mississippi Recycling Coalition grant, SEAL students developed an idea to allow for the recycling of electronic waste on campus along with the current recyclable materials. Electronics are the fastest growing portion of the waste, so SEAL felt it was imperative incorporate the disposal of old cell phones, laptops, batteries, and chargers into the existing MSMS recycling program. As MSMS students live in a residential setting, SEAL aims to serve as the state’s hub for e-waste removal. Students who come from all corners of the state can bring their old or broken electronic devices back to Columbus so that they can be collected in one central location at MSMS and then disposed of properly. SEAL sponsor Dr. Bill Odom is a science instructor at MSMS with a passion for aiding his students and their determined efforts. “There are two thing we’re looking to do. The first of which is to try and educate younger students about recycling and to instill in them an environmental conscientiousness. Environmentalism is not free, and it has to live in the minds of the people and they need to be taught it and we need to work at that. The other thing is that most places do a poor job of recycling e-waste, and I think it’s an opportunity for us to take the lead on that, hopefully statewide,” Odom commented. Along with serving as the statewide hub for e-waste removal, SEAL is also determined to focus on community outreach opportunities to promote a wider awareness of the dangers of waste accumulation in landfills. SEAL plans to hold informational presentations with the local Boys & Girls Club Columbus to inform and encourage students from a young age to involve their families in the effort to save the planet. The awarded grant amount will impact the students and staff in a manner that motivates them to continue the school’s recycling efforts and introduce new recycling methods to the community with the implementation of electronic waste removal services.